Tom “Let Them Fly Coach” Price. When Politico revealed last week that Health and Human Services Secretary Tom Price has taken at least 24 flights on private charter planes since early May, which cost taxpayers more than $300,000, the department initially argued that the hassles of flying commercial shouldn’t come between the secretary and the American people. 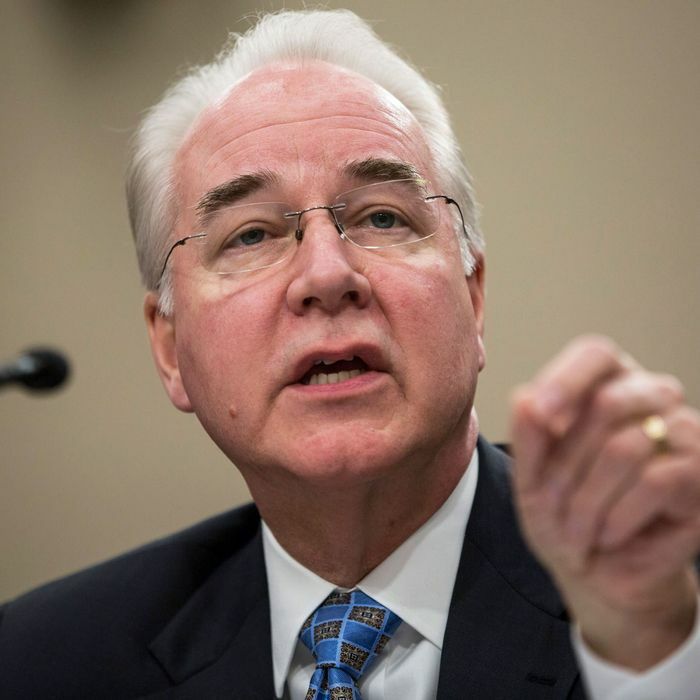 Price said the HHS inspector general is conducting “a review and an audit” of the travel-approval process, and he also initiated an “internal departmental review of the procedures.” In the meantime, he won’t be taking any private charter flights. Price said he mainly flew private for events involving the opioid crisis or the hurricanes (Politico says ten flights were unrelated to either topic). He does, in fact, know how to rough it. “We’ve taken many, many trips in cars — sometimes four and five hours at a time,” he said.